Well, this necklace is a little bold, but sometimes you just have to make a statement. 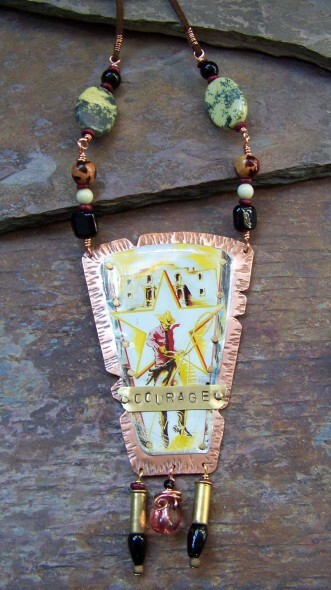 A piece of re-purposed tin with an image of a cowboy and the Alamo are the central elements. 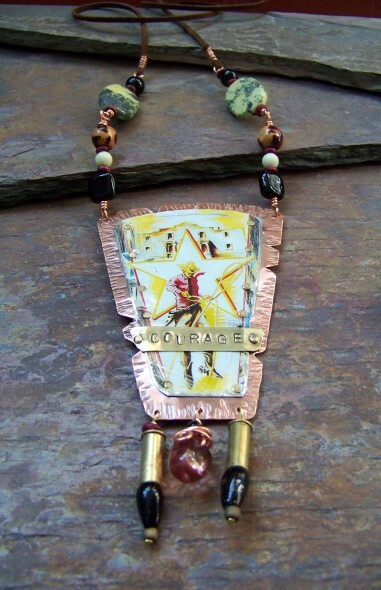 It is cold connected with brass rivets to a piece of hand cut and hammered copper with the word “courage” stamped onto brass and riveted on top. The dangles are made of 22 cal. bullet shells. The back of the necklace is leather for a comfortable fit on your neck and it is long enough to slip over your head without a clasp. It also includes stone, wooden, and glass beads. Don’t you need this for your rodeo attire?